Good morning dear bloggers. Radar image is positive. Any chances of rain today? I have taken leave already. significant cloud formation in north bay of bengal – off Orissa coastline.. Any reasons? Kea small correction… Rameshwaram comes under Ramnad district… Change it in rainfall warning.. They are not even reaching the coast. here east looks dark but its not moving at all any reson? Scorching sun expected today !! The spread of the northeast mon soon, which set in over Tamil Nadu on Wednesday, was hampered by the Chapala cyclone in the Arabian Sea. It is because of this that the low pressure in the Bay of Bengal near Sri Lanka has developed into a depression, the Met department said. 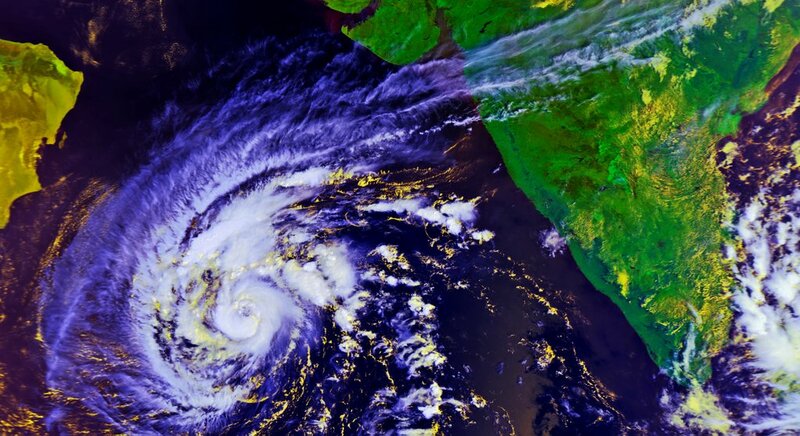 The cyclone is expected to move towards Oman by Thursday night or Friday morning. The northeast monsoon is officially here and the Met depart ment has predicted the city will get at least a week’s rain starting from midnight on Thursday .The water managers are, however, keeping their fingers crossed. Much will depend on the catchment areas of the reservoirs and the supply channels leading to them, they say. Professor of applied geology at Madras University Bal lukraya said spells of heavy rain for about a week or more could cause levels to rise dramatically. “There needs to be continuous rainfall for a week with a daily average of about 50mm. A few strong spells, with cyclonic activity, could even cause the lakes to overflow,“ he said. On Thursday , the city received 16.4mm of rain. The supply channels to the reser voirs have been cleared of blockages to ensure full use of run-off water, said Ambujam, director of Anna Univer sity’s Centre for Water Resources. In the last three decades, check dams and other rainwater harvesting structures have limited the flow of run off. “Through borewells, we are ex tracting much more than our aquifers can offer. Reservoir levels have fallen as run-off water is not reaching them anymore,“ Ballukaraya said. The Met department has predicted rain and a maximum temperature just below 30 degrees Celsius for the next one week. “Subsequent spells could be more intense and bring heavier rain fall. Rainfall predicted for the next week may not be very heavy ,“ Raj said. Rainfall has been widespread in coastal Tamil Nadu but scanty in inte rior parts. “Chennai and nearby dis tricts like Tiruvallur and Kancheep uram have not received widespread rain,“ said regional meteorological centre deputy director general S B Thampi. Hi CM ji does the wind supports to move TS towards us? A number of international forecasters are now scouring the Bay of Bengal for signs of a storm developing in the basin. IMD has now joined them to mount a watch for a low-pressure area likely taking shape to the South-southwest of Andaman Sea during the first week of November and intensifying. What gives them confidence is the fact that the storm-builder Madden-Julian Oscillation wave is widely expected to stay anchored over the waters in the region at least until November 3. A small storm nearing central and South Chennai .. Hope it doesn’t dissipate before crossing the coast..
Perunchani dam had water at 74 feet, against its capacity of 77 feet, water stood at 42.77 feet in Pechiparai dam (48 feet). Water level in Chitrar I, Chitrar II, Mukkadal and Mambazhatharu dams have already reached their full capacity. Myladi recorded the highest rainfall of 80 mm in the region. Following is the rainfall (in cm) recorded in Kanyakumari district in the last 24 hours ending 8.30 a.m. on Thursday: Myladi 80, Kurunthancode 75, Aanaikidangu 68, Pechiparai 65, Mambazhatharu 55, Eraniyal 53, Kozhiporvilai 45, Kottaram 43, Buddhan Anai 37, Perunchani, Colachel and Surulodu 36 each, Adayamadai 35, Mullanginavilai 34, Nagercoil 27, Boothapandi 19, Chitrar II 16 and Chitrar I 10. Tuticorin district also experienced widespread rainfall. 80cm, 75cm?. It should be in mm..
if diwali system goes to wb. we can forget nem in 2015. Not today. maybe tomorrow once low moves into Arabian sea. Bands moving slowly towards chennai. might make it to the city in another 2 hours.have to wait and watch. where was the system expected to cross chn? Eye wall pressuring upwards , CDO very defined. Gokul ji post this Chapala iam confident of a system for Tamilnadu if WD does not spoil sport. Hopefully wishing for the same. My friends dont worry about rains. After Chapala in Oman and its dissipation post landfall we will surely get rains. Only 2 NEM’s post the Cyclone Nilam NEM failed. So This NEM will be a blockbuster but lets wait for Chapala landfall. Rao ji why is it a diwali system is it going to make a landfall on the 10th of October diwali day. I feel if your parameters hold good on MJO sure short cyclone. First let a system form and then you can talk about it’s significant development into cyclone.. and btw Diwali is November 10th.. The image shows convective bands, the curved stripes of clouds that are a familiar sight in satellite images of cyclones.The banding indicates a circulation center may be coming together. Warm sea surface temperatures in the Bay of Bengal could also help a full-blown cyclone to develop. For the cyclone to take shape we need MJO at phase 2 and system below 15N. my concern is the follow up system in Arabian Sea. BBC predicts it as a well marked system as of 1/11 and strengthens the day next. will it come true? Look at that cloud cover! Do we prepare for flood? Or do we prepare for drought? Hurricane Sandy made landfall near Brigantine, New Jersey, on Oct. 29, 2012, on an unprecedented path. After paralleling offshore of the Southeast, Sandy hooked back to the west into the Northeast as it combined with a non-tropical system. Sandy’s storm surge created some of the most devastating impacts, destroying homes along the New Jersey coastline and flooding New York City’s subway tunnels. As cold air was drawn in, blizzard conditions unfolded in western North Carolina and West Virginia. From 30cm to now waiting for 3cm. Nothing good according to cyclone brothers. No no good things will happen. Wait for Chapala to dissipate. wait be patient. Chapala will dissipate post LF then we will get rains. My early morning rainfall prediction failed miserably. Rains may start soon in chennai and it’s going be a constant one. Not even in your wildest dreams! Are you really referring to the cyclone in Arabian Sea or the weak 93B here? The easterlies are strengthening over the north bay. Safe forecast by Mr. Ramanan in the Hindu today. City will receive 1 or 2 spell of rain for next few days. what more we can expect from an IMD official? i think he is right in his comments. Last year Tirunelveli district got 85% excess rainfall in NEM, now this year its gonna be Kanyakumari I think. 300300Z POSITION NEAR 14.2N 61.5E. what is tht in north bay ? sel what about the rains ?? Which year heighst Dec rain recorded in chennai???? Will dry air of middleast kill tc? yes it will rapidly weaken once near land! UAC moved west,now seen over comorin sea..
is it a good news?? Radar seems to be working. Does the stroms shown in radar will reach us or dissipate? But the same forecasts expecting a wipe out for TN this November by taking the system to North Bay. Don’t rely on any forecasts for time being! Its better to see a cyclone forming in Bay and crashing into AP/Odisha/WB than a cyclone in Arabian Sea crashing into desert sands of Yemen/Omen. Your wish will be granted this November! One or two days of rains will never help especially in an arid desert like Yemen/Oman where water percolation is negligible. Nature would need to balance its energy budget within climatological regions. Somehow it will try to remove excess available energy from the equatorial regions towards poles for a balance equation. El Nino along with some intraseasonal oscillations enables these initiation process where ever its available. Of course this is on lesser climatological sea compared to average conditions. Micro popups building near chennai coast. 2011 type swm thunderstorm waiting for us with lanina. Why have you moved to 2016? One for Nunga and the other one for Tambaram !!!! Good sel! Looks like Chapala is getting unstoppable! Dear all don’t worry, this year we will surely have good rains, intested trusting models we should trust in god. He will make wonders. can a LPA form without models predicting it? Well we have to wait for sandwich,which is in preparation now!!! Sadly, I find a rising trend in frustration, disappointment and hopelessness in bloggers with almost every resource… from Radar to Rain…..
A humble opinion from a long-term silent spectator. How can manage without water? Do u think October ll bet july?? Trough needed to move west to get rain. chapala may break gonu’s record. I think things will change considerably after chapala is out of the way. Let’s see how conditions change once it’s done for. Normally out of 70 odd days of NEM season there would be rain for 30 odd days. Out of which only 10 or so will be more than 30-40 mm per day. Let us hope that his year though delayed, NEM extend to end dec as per IMD FORECAST. Still we have chances of 30 days of wet days. Let us hope and pray for more >5cm days. May be for this ARB system should end and no more ARB system. Its dark here. Repeatof yesterday possible? North-East monsoon flows are expected to strengthen once ‘Chapala’ weakens. MJO ..Why does it want to stay only till November 3rd? Pls invite n we shall take it to USMAN road, do some Deepavali purchases , buy crackers , and befriend him/ her ( sorry , no idea about the gender) and wish him/ her an extended stay till December 31st after enjoying X Mas and possibly we could give him/ her a warm send off..
MJO ..You are cordially invited to our region. Feel at home. You can also blog with us if you find it interesting..Hope you will understand our “paavamaana” situation. City may experience heavy showers this week.It is because of Chapala in ARB sea that is spoiling our chances. City has received a total of 157mm this October with a deficit of -54%. did the low move up? Who said it’ll move up? I said it’ll move to GOM. forecasts by IMD goes for a big task. not even drizzling in the past 24 hours. a big disappointment. they said heavy to very heavy rains over coastal tamil nadu for 2 days. bright sunshine in anna salai. chennai is also part of coastal. they said moderate to heavy for chennai. nothing. For Madras, they just said, cloudy conditions with isolated showers at few places. Note: Nowadays, We become well-versed only to blame others…. Thy told 1 or 2 spells for chennai tats all.. Omg!!! Is 2015 mimic 2013… No……. No matter how good forecasts may be we can never ever rely on NEM.. The unusually long good phase of NEM from 2004 to 2011 was good.. but now it looks like the law of averages is catching up. Rohit. Started only from 2005. Chk 2004 figures. Below normal NEM. Edho.. purinja seri :P. How was your calcutta trip? Enjoyed every minute of my stay there in “The City of Joy. Since you asked me, I would like to bring to your notice the hospitality extended by our Vagaries friend Santosh Subramanian to me during my 3 days of my trip. Thanks to the weather community, I sought the help of Santosh though I’ve hardly spoken to him except for one Con call with him along with our KAR some months back. He came to th station in the wee hours 4am) to receive me. TOok me to his home, introduced me to his parents.,breakfast and all..He had even booked the hotel room for me ( Rao’s Udipi Home) . I was speechless n spellbound by the way he drove me around the city and showed me some interesting places. He even came to see me off at the station at 11.45 pm in the night. Thanks Santosh for everything.You made me feel at home. Thanks to this blog n the weather community in general. We have friends to bank on when we go to a city for the first time. It was my first visit ever to the Great City. When a disturbance, WD can beat NEM, NEM is not a monsoon. It is to be called as eastern disturbances ED. It is so erractic and succumbed to all , even feeble forces and sometimes not existing. What kind of force is this. Pathetic. Sign of System moving into Arabian Sea though comorin. Papanasam records 93 mm. Most likely to top charts today.